Rugrats Presale is an opportunity for anyone to shop the sale early! 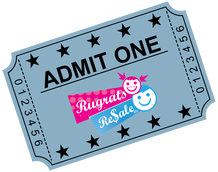 While our Volunteers and Consignors always shop earlier than anyone, a limited number of Rugrats Presale ticket holders are invited to shop from 5pm to 8pm on our Presale Day. Each ticket admits 1 attendee. Babies in carriers and children in strollers are free with a ticketed adult. All other kids must have a ticket. ​The cost is $10. Ticket holders will give their name to the greeter at the door so be sure to put the correct name on the check out page. If purchasing more than one ticket, be sure to include all shoppers' names.